On Monday, I was somewhat sympathetic towards Sarah Sands, editor of the London Evening Standard. One of the biggest stories of the year had broken in time to make that day’s final edition, but the headline was buried behind an ad. Well tonight I have less sympathy, as a nonsense story is “developed” by the right wing press, and her paper came up with a headline possibly even more ludicrous than this morning’s Mail (see above). Lots of people are furious that the BBC might have played a song because lots of people had bought it and pushed it into the charts. I can’t be bothered to even get into the asininity of the whole thing. You can read about it just about everywhere else. In any case, I don’t particularly want to get involved in Margaret Thatcher. She was the first Prime Minister I recall, having been nine when she came into power. But the faux objectionableness being delivered by our free press who seem so keen that another outlet should participate in self-censorship is galling. 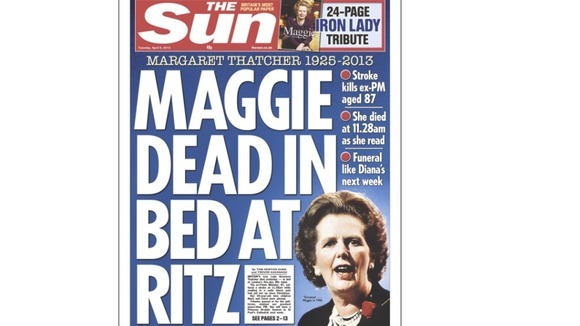 The thing is, the most objectionable Thatcher coverage I saw anywhere this week, was the cover of Tuesday’s Sun. 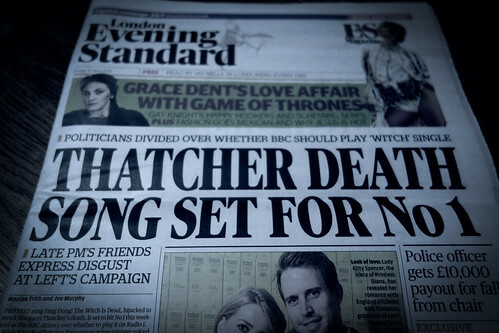 Considering that Thatcher did so much for Rupert Murdoch in dismantling the power of the unions (listen to this week’s Radio 4 Media Show for more), then this was a fairly contemptible headline. Whether the paper thought it was being funny, I don’t know. But Dominic Mohan’s cover completely misfired. It comes to something when even the Daily Star had a more measured front page. I tend towards a “live and let live (or die)” attitude. She was an elderly lady who’d been in some decline for years. I didn’t agree with her politically, and I’ll leave it at that. Incidentally, is it just me, or does it feel fairly straightforward to get a song into the charts? A couple of weeks ago, having performed their biggest hit for the first time in years on primetime ITV, Ant and Dec got a number one. And now we have this, albeit not yet at number one.